The world can be a very stressful place. We live under a constant deluge of news and information, and it’s so easy to get overwhelmed by it all. And while games can be a wonderful escape, you need the right games to restore your spirits and put you in a good mood. As much fun as co-op games like Forbidden Island, The Oregon Trail Card Game, and Castle Panic! can be, they can also be a little stressful. And if you’re looking to relax, or to chill out after a long week, those might not be the games for you. So today, I thought we could turn our attention to games that are as tranquil as they are tactical, in the hopes of helping my fellow PuzzleNationers enjoy a calm gameplay experience. When I asked fellow game enthusiasts for games that are mellow and relaxing, the first one that always comes to mind is Tsuro. 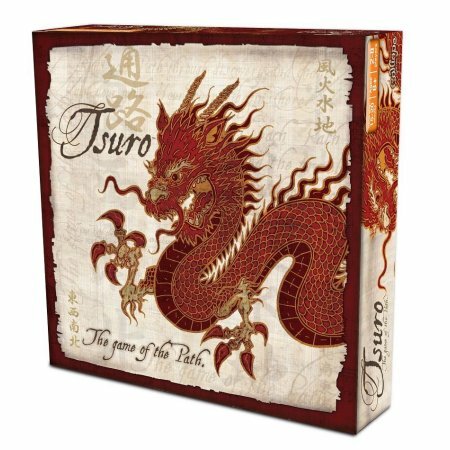 Despite the potential for competition, most Tsuro games are peaceful affairs as everyone enjoys watching their dragon token loop and swirl across various intersecting paths, hoping to be the last dragon standing on the board. It’s a beautiful, simple game that only takes about twenty minutes to play, and it’s the perfect palate cleanser after a more stressful round of some other game. Tokaido is another game about movement, but in a very different vein. Players in this game are all travelers, journeying across Japan’s famed East Sea Road from Kyoto to Edo. Whereas most travel-based games are about reaching a destination first, Tokaido is about reaching a destination with the widest array of meaningful experiences. Along the way, your character can meet new people, enjoy new cuisines, collect souvenirs, visit hot springs, and visit scenic locales. You add experience points for these events (and acquire achievement cards) to represent your traveler partaking of these experiences. This elegant game bypasses traditional competition entirely, building a unique game mechanic out of living your best life. Sagrada is another wonderfully visual game about individual accomplishment. 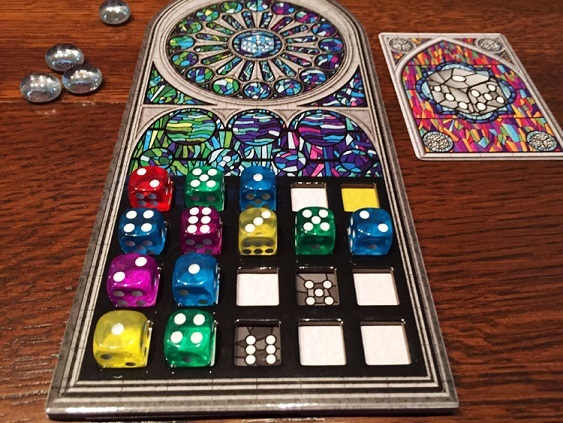 In this game, each player is building a stained glass window using different colored dice. No dice of the same color can neighbor each other, so you need to be strategic about how you place the dice you roll. Each window is different, and has certain rules for maximizing points. (A certain pane can only be a certain color, or a certain die value, etc.) The players can boost their scores by selecting cards that reward them with points if they create certain patterns within their stained glass window. Except for competing for the best point total at the end, there’s virtually no interaction between players. You’re all simply working simultaneously on the best window, which is a gameplay style that breeds camaraderie more than competitiveness. It’s genuinely encouraging to see fellow players make good choices in dice placement to create the most beautiful, elegant window patterns. For a change of pace, let’s look at a game that’s more about interaction with other players. 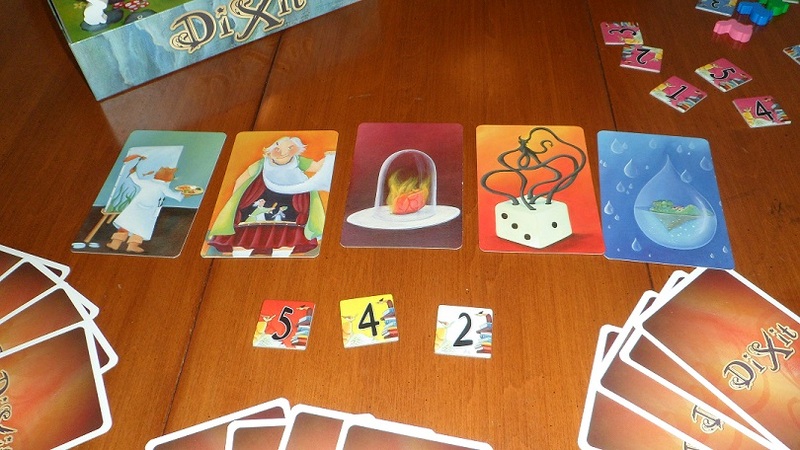 Dixit is a gorgeous card game where each player is given a handful of cards, each depicting a different, unique, evocative piece of art. Player 1 will choose a card from their hand and say a word or phrase to the other players that has some connection to that card. It could reference color, or part of the imagery. It could be a joke, or an idiom, or a song lyric. The goal is to be vague, but not too vague. The other players will then each select a card from their hand that could also be described by Player 1’s statement, and the cards are all shuffled face down so no one can see who submitted what card. The cards are then all placed face up, and each player (except Player 1) votes on which piece of art they think Player 1 chose. Player 1 gets points if some (but not ALL) players chose his card. (If every player chooses it, the clue was too easy, and Player 1 gets no points.) And any other player’s card that earns votes also earns that player points. This sort of associative gameplay really encourages your imagination and teaches you about how the other players think. There’s no other game quite like it on the market today, and it makes for an intriguing, low-key gaming experience. Finally, let’s close out today’s post with a classic tile game that mixes Uno-style color- and pattern-matching with Mexican Train Dominoes-style gameplay. 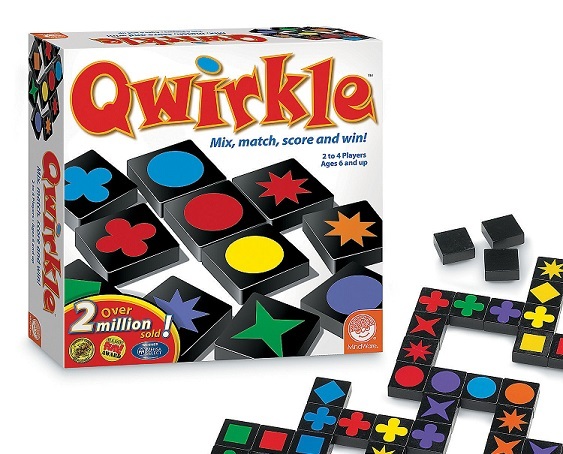 Qwirkle is a bit more competitive than the other games on today’s list, but it’s still a game more about collaborating than outdoing your opponents. By placing different tiles onto a shared play area — either by matching colors or matching symbols — players earn points. If you complete a Qwirkle — a pattern of all six colors for a given shape or all six shapes in the same color — you earn bonus points. The lighthearted gameplay style lends itself to friendly competition rather than the cutthroat mien evoked by games like Monopoly. Qwirkle’s not about grinding the other players down, it’s about adding to a colorful world in interesting, inventive new ways. Hopefully these suggestions will make your game nights a little more mellow. And if you’re looking for puzzlier ideas for a tranquil game night, check out our reviews for ThinkFun’s Kaleidoscope Puzzle and Looney Labs’ Zendo, both of which might scratch your puzzly itch in a relaxing fashion.